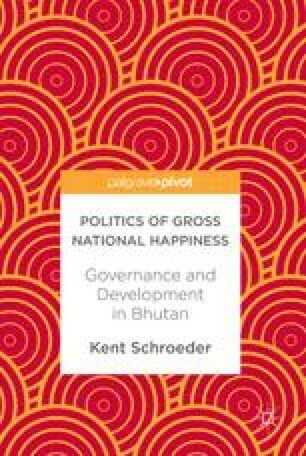 This chapter synthesizes the main themes from Bhutan’s experience implementing four policies using the Gross National Happiness (GNH) governance framework. It further explores the broader insights from Bhutan’s experience for governance and human development. It argues that the fractured and contested nature of governance in the policy implementation process should undermine the achievement of GNH outcomes. Nonetheless, socially constructed cultural values often shape the governance process in a manner that successfully achieves GNH outcomes. At the same time, these values themselves are subject to change. This chapter concludes by drawing out two broader insights for governance and human development related to the complex nature of power and the potential role of cultural values in shaping complex power. GNH Commission. (2016). Twelfth five year Plan guideline. GNH Commission. http://www.gnhc.gov.bt/12th-fyp-preparation/. Accessed Apr 2 2017.